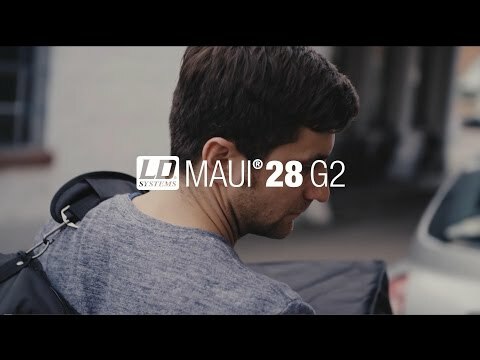 Considering purchasing the LD Systems MAUI 28 G2 - Black? Have questions? Ask people who've recently bought one. Do you own the LD Systems MAUI 28 G2 - Black? Why not write a review based on your experience with it. This particular LD system was one I work with regularly. IT IS FLAWLESS. Lets start from the ground up... The Sub Cab holds 2 x 8" cones. This provides a base that does not distort at all as the LF are carried through 2 speaker the system can provide better quality the low frequencies it projects. Although for a lot of people 8" cones on a sub might be a no go, even two of them; its perfect on this speaker. The Whole system is Modular Line Array, everything slides in to place excluding the need to run XLR all over the place and only to the Powered sub or to daisy chain to other powered speakers. The tops provide some of the best sound quality for a portable PA I've ever heard. The speakers run all the way from the sub meaning the projection of sound is not lost, plus although the top speaker cones are minuscule compared to most portable PAs there are 16 of them in a full run. Meaning (as with the subs) you get the fantastic sound quality without the speakers being over worked and distorting. Even at full wack with one of these systems a side (1000w RMS a side) which is very loud by the way. This system still sounds unbelievable. Which is ultimately the main benefit of having a line array set up. These Speaker along with honestly pretty much any LD MAUI system I've used are Amazing! 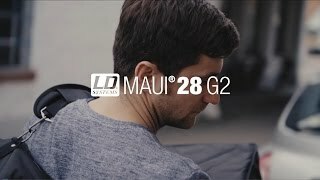 Seen a video for LD Systems MAUI 28 G2 - Black online or have you own video? You will earn 1,708 loyalty points with this product worth £4.27, when logged in. Check out LD Systems MAUI 28 G2 - Black on DJkit.com!